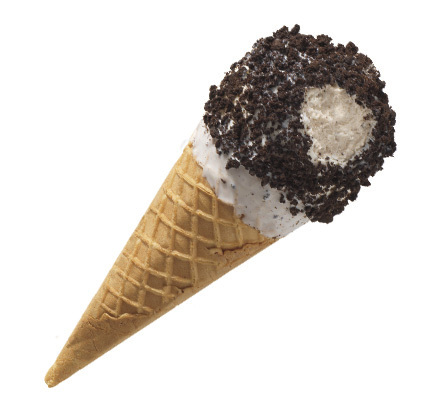 Cookies 'n Cream reduced fat ice cream in a sugar cone dipped in white coating topped with chocolate cookie pieces. Case Dimensions: 9.9375 in. x 6.8125 in. x 9.75 in. Ingredients: Sugar, Milk, Buttermilk, Cream, Bleached Wheat Flour, Skim Milk, Corn Syrup, Coconut Oil, Whey, Wheat Flour, Contains 2% or less of Enriched Wheat Flour (Wheat Flour, Niacin, Reduced Iron, Thiamine, Riboflavin, Folic Acid), Cocoa, Unsweetened Chocolate, Cocoa Processed with Alkali, Cocoa Butter, Natural Flavor, Vanilla Extract, Canola Oil, Hydrogenated Cottonseed Oil, Food Starch-Modified, Molasses, Mono & Diglycerides, Carob Bean Gum, Cellulose Gum, Carrageenan, Soy Lecithin, Salt, Caramel Color, Soybean Oil, Palm Oil, Artificial Flavors, Baking Soda, Corn Starch, Titanium Dioxide for Color, High Fructose Corn Syrup, Vitamin A Palmitate.